Runs for Cookies: Last-minute weekend trip! A few weeks ago, my younger brother, Nathan, told me that he was going to Washington for work. He doesn't usually travel for his job, but this was an awesome opportunity. He'd never been to the Pacific Northwest, so when I heard he was going to be out that way, I told him he should try to drive down to Portland on his weekend off (August 7-9). When I was in Portland in March, I absolutely fell in love with it! Later, my older brother, Brian, was talking about a big work trip he had coming up. He's a Delta pilot, and his trip was going to be 14 days flying back and forth from Japan to Hawaii (with layovers in each). I knew his Japan trips usually originate in Portland, so when I asked, he said yes--he would be going to Portland first to start the trip. He would be flying to Portland August 7th. I couldn't believe the coincidence that BOTH of my brothers were going to be in my very favorite city at the same time! Brian knows I adore Portland, so he said that he'd give me a buddy pass if I wanted to try and fly out there at the last minute to meet up with him and Nathan. It wasn't an ideal weekend for me to go, because Jerry had to work all weekend (otherwise, it would have been awesome for him to come with me), but my mom said she'd take care of the kids. The last time I tried to use a buddy pass (to go to Phoenix to visit my friend Sarah), the plane was too full and I wasn't able to get on the flight. I was really skeptical about making it to Portland, but I couldn't pass up the opportunity to hang out with both my brothers there. Brian listed me on a flight that connected through Minneapolis, and then he and his wife, Becky, would join me on the flight to Portland. It would be so fun if it worked out! So, Friday morning, I actually made the 7:25 am flight to Minneapolis. The flight was wide open--there were actually about 30 empty seats on the plane, even after all the stand-by people got on. I get nervous about stand-by because you don't get to choose your seat, and I hate sitting in the back of the plane. I always prefer a window seat as close to the front as possible. Anyway, I wound up in a window seat of an exit row, which meant I had a ton of legroom. And the seat next to me was empty. Score! Once in Minneapolis, I had a long walk to the gate for the connection to Portland. Brian had told me there were 12 open seats, and I was #11 on the list... so I was nervous I wouldn't make the connection! I saw Becky and Brian waiting at the gate, and we stood around waiting to see if Becky and I were cleared on the stand-by list. 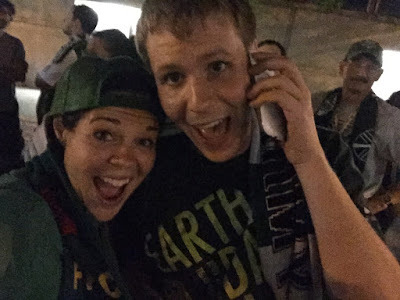 Finally, we got seat assignments, and then it became a reality--I was going to Portland for the weekend! They assigned me the very last seat on the plane (and this particular plane had the engines in the back, so it was an extremely loud place to sit). Becky was assigned a few rows ahead of me, so she offered to switch me. 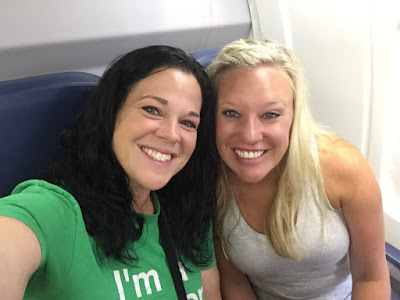 After we sat, the flight attendant asked if I'd like to sit with my friend (Becky), so she asked the woman next to Becky in the back if she'd like to switch. We did. I was terrified to be sitting in the back, but a little more comforting to have Becky with me. A couple of minutes later, the flight attendant came back to us and said there were a couple of open seats together about 10 rows up, and asked if we wanted to move out of the super loud seats. That was a relief! Finally, we took off for Portland. Brian was sitting in the Delta Comfort+ section, and there were a couple of empty seats next to him. Apparently, he asked the flight attendant if Becky and I could move up there, so after take-off, that's what we did. Delta Comfort+ has more legroom, free drinks, premium snacks, etc. So I ended up going from the back of the plane to the Comfort+ section, which was awesome. 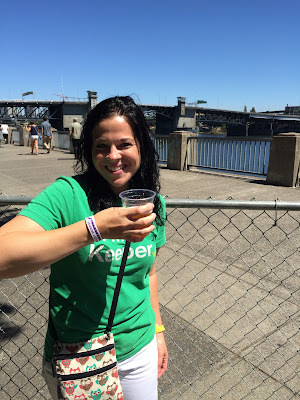 While we waited for Nathan to drive in, Brian, Becky, and I went to a Beer/Food/Wine Festival on next to the river. It was a gorgeous day for it. Once Nathan arrived, we stopped and had a drink while we waited to go to dinner. We headed to Killer Burger for dinner, where we met up with Thomas and Libby. 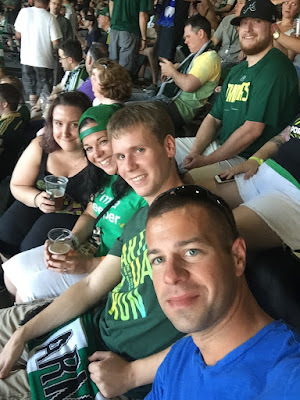 There was a Timbers game that night, so after dinner, we went there to watch the game. The Timbers won, so that was exciting. I wanted to stick with my running schedule while I was here, so I did a long run on Saturday morning. I would have loved for Nathan to run with me, but he wanted to do trail running, so he drove to Forest Park for his 26-miler(!) and I just started my 10-miler in downtown Portland next to the river. I planned an out-and-back route that went across the river and along a path that led to a park, then went a couple of miles into the park before turning around to head back. I'd forgotten to bring my handheld water bottle, but I had a small bottle of water from the plane that I brought with me. I hoped there would be water fountains along the way that I could just refill as needed. 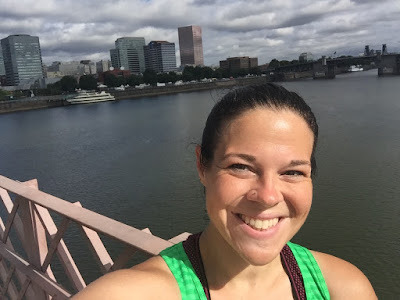 My stomach was not feeling good (no doubt because of the beer I drank the day before), but I just tried to enjoy the scenery and be happy I was running in Portland. My mind was just blown at how many people were out running or bike riding or walking. There were HUNDREDS of people along my route! It was honestly like running in a race, because there were that many people around. I've never seen anything like that before. I got a little confused at one point as to which direction to take, and before I could even pull up Google Maps on my phone, a man on a bike stopped to ask if I needed help. I learned he was from Michigan, too, so we chatted for a few minutes and he explained where I needed to go. I passed one water fountain at around mile two, but I hadn't even started drinking my water yet. By mile five, I was really thirsty, but I hadn't passed any other fountains, so I started trying to ration my water. I was dying of thirst by mile six, and I just kept hoping to make it to the fire station, where I remembered the water fountain. My run wasn't going well at all. My pace was slipping more and more. During mile six, I even switched my running intervals around (they were 5:00-run and 0:30-walk). I switched them to 3:00-run and 1:00-walk, but I was still struggling. When I finally made it to the water fountain (mile eight), I nearly cried with relief. I chugged down three bottles of water, and then just sat down for about 20 minutes. I had been hoping to do 10 miles, but I thought I'd better just take a shortcut back to the hotel, which was a mile away. I started running up a bridge to take me across the river, and got really nauseous. I knew chugging all the water at once was a bad idea, but I was so thirsty I couldn't help it. I stopped on the bridge to hopefully let my stomach settle, and I took a couple of pictures. Then when I tried running again, the nausea came back. Ugh. I decided just to walk the rest of the way to the hotel. Brian and Becky had to leave for Japan that afternoon, so I wanted to hang out with them a bit anyway before they left. The run went MUCH better than Saturday's! I got in all 10 miles (at a relatively slow pace, but I wasn't worried about that). The scenery was beautiful, and I had my BFF's company (and drill sergeant attitude when I wanted to quit early, haha), and it was all-around a good run. It was SUPER hot outside, but I'm glad I toughed it out. Nathan had to run 10 miles today, too, but he wanted to do trail running, so I'll meet back up with him in a little while. Then, sadly, it's time to head back to Michigan. So happy for you that it all worked out in the end. Your parents must be so unbelievably proud to have raised 3 children who have such a tight bond and get along so well. It is so refreshing to read when you talk about how close you all are. There are four siblings -- she has a sister too! Thanks! It's interesting, because the four of us weren't very close growing up, but as adults, we've gotten much closer. 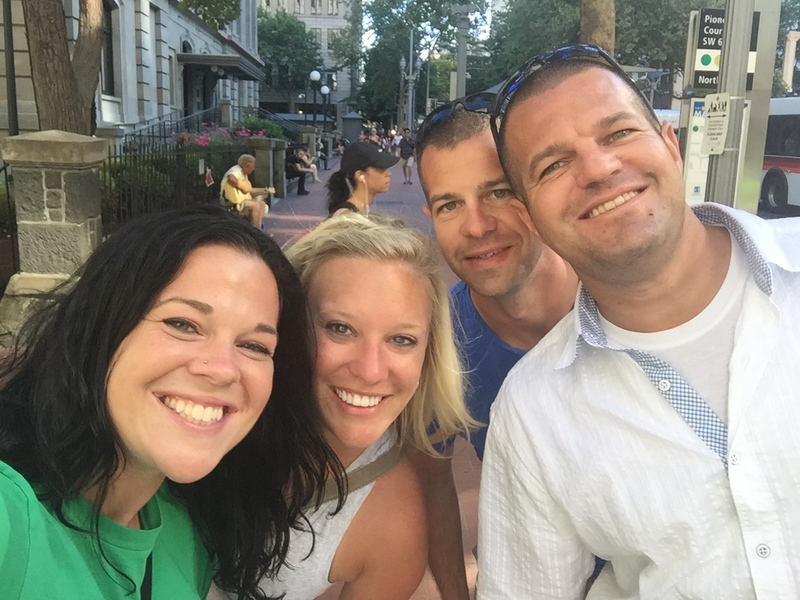 I love spending time with my brothers and sister! Portland is awesome! You should seriously consider running in the Portland marathon or half someday. It's really well organized and fun. I was so excited to run the Shamrock 15K in March, but my stress fracture stopped me from being able to do it. I absolutely love Portland, though, and I'm sure I'll be back next year. Maybe I'll look for a race then! I'm so glad that you love my city! Portland really is a great place! It is awesome... so much to do and see! I love running in Portland. And now that I have a new grandbaby on the way, I'll probably be making more trips up there soon. It's an awesome city to run in! I cannot believe how many people were out running on Saturday morning. Very fun! You guys are so close, that's awesome! My siblings and I have really drifted apart, I find it very difficult to keep in contact with them. Sounds like Portland is a very healthy city! Hahaha...the guy in back reading a book and then his phone was hilarious! It's interesting that my siblings and I have gotten closer over the years--when we were growing up, we weren't very close at all. We live in different states, so you would think we'd grow apart, but we have a lot of fun when we do get together! I'm so glad that you and your brothers got to enjoy this trip together! I'm also impressed that you roughed out your runs!! Those skyline shots of Portland are beautiful!! *toughed out your runs, lol! Katie, I honestly laugh sometimes when I read your posts because, like so many of us, you are so hard on yourself! Did you ever think, years ago, that you'd spontaneously fly to a new city on a random weekend and run 8-9 miles and say that "wasn't a success"!? I'm so impressed by your drive, and I aspire to one day run 8 miles in a place I've NEVER been before and say that it wasn't a success. :) A good problem to have! Also, I know that the opinions of others should only matter so much, and what matters most is how you feel about yourself, but for what it's worth, you look great. Like, really. You look awesome to everyone else, so if/when you have moments of feeling like you look terrible or aren't where you want to be, weight wise (like me), just remember that everyone else is looking at you and saying "WOW I'd love to look like her!" I agree, I am definitely too hard on myself sometimes. I should have looked at the 8-miler as an overachievement, because I was only scheduled for 6 that day! ;) But 6 years ago, I NEVER would have 1) Gotten on a plane, or 2) Go for a run on vacation. Haha! And thank you. I wish I could be happy with the way I look right here and now, but I'm still working on that. I felt so good when I was 135 pounds and I was very happy with my body. Seeing this extra weight is hard to take in. It's nice to have someone else's perspective--I appreciate that! Yay, I'm so glad you got to spend some time in beautiful Portland!! I wonder if Nathan liked his running in Forest Park... there are so many awesome trails there, but some are quite steep! I'm so jealous, I miss Portland so much! Thanks for letting us live vicariously through you with the post. :) Congrats on gutting it out through the runs too - exercising in the heat is almost as low on my "to do" list as going to the dentist. :P You rock.